MV Agusta has released details of its new £11,499 F3 800, which will hit dealers in July. 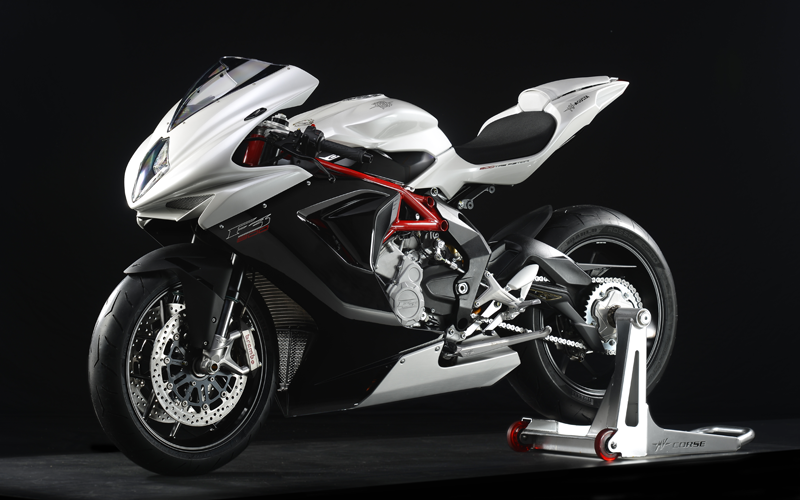 Based on the current inline-three cylinder F3 675 supersports machine, MV says it tips the scales at the same 175kg (dry). The 798cc engine, which has a backward-rotating crank, uses the same bore as the F3 675, but has an 8.4mm longer stroke. MV claims 148bhp and 65ftlb of torque at the crank. Like the Suzuki GSX-R750 and Ducati 848 Evo, the F3 800 promises to offer the perfect balance of power and handling – as nimble and easy to ride as a supersports machine, with the punch of a superbike. It will come with a higher spec than any of its rivals, boasting a full electronics package including ride-by-wire, traction control, an electronic air-bleed system and variable power maps. It also has a slipper clutch, Brembo monobloc calipers, fully-adjustable Marzocchi forks and Sachs rear shock and an optional quickshifter. We’ll be riding the F3 800 at its world launch in Misano on Thursday, so keep an eye on www.motorcyclenews.com for our first impressions. MV Agusta F3 800 ridden!